* The S 406-line of transmitters was the main high-frequency transmitter type used by German U-boats throughout WWII. *Because of the complexity of the S 406 model, extra "technical" pages have been added to the end of this section for those who would like to dig a little deeper into the workings of this transmitter. * The "36" indicates that this particular model of the S 406 was accepted for use into the Kriegsmarine (German Navy) in 1936. * "(S)ender" means "transmitter" in "U-Bootsender." * How is your Dutch? Nonexistent, like mine? 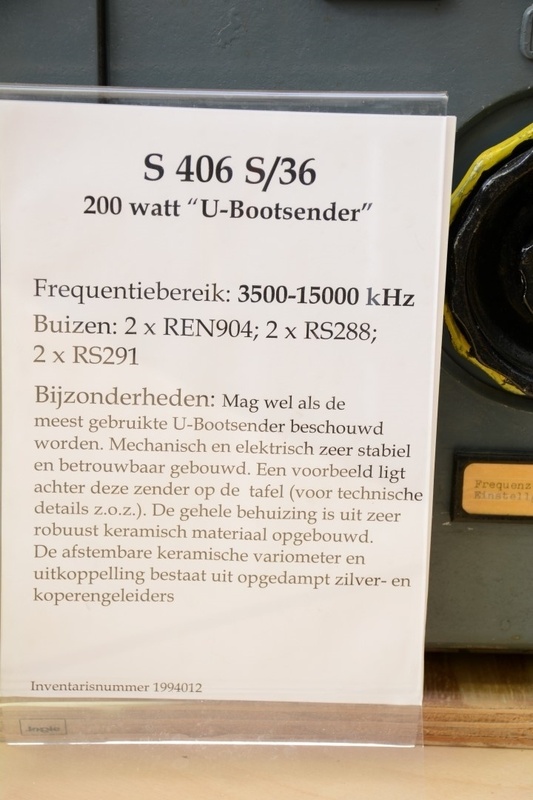 That's OK. My brilliant Technical Editor, Dieter Blumenthal, has taken all of the information on this card written in Dutch and included it in the text boxes of this radio. Photo by permission of the Stg.C.D.V.&T.